Born on Valencia Island, Co. Kerry in 1943. From 1960-67 he studied at the National College of Art and Design, the Limerick School of Art, and the Dublin Graphic Studio. He also studied film making in Germany. He was taught by Maurice MacGonigal and Sean Keating. Harper works in series and his preoccupations have focused around the human figure, with a brief expansion into landscape paintings in 1995. He is a humanist painter, a reactionary, whose work is concerned with the problem of the human condition. Inspired from magazines he states “ I draw from magazines and use them as a research source. I want to draw the flat image. I prefer direct nature, but media is what is effecting people now, that’s how people are orientated. The whole idea of art is to crystallise, to understand how people are orientated in the time you’re living in” . He was influenced by Franics Bacon and David Hockney apparent in his portrait work. In his treatment of the human head the influence of Bacon is obvious as is the work of the Irish artist Louis Le Brocquy. He was also influenced by the Irish artist Patrick Collins. For Harper the actual act of painting is what matters as he sees the actual process as one of exploration and discovery. He says “ the process, the making excites me more than any end product” . Drawing, shape and colour are important to him and how they are translated onto the painting. He uses the motif of the head continuously drawing inspiration from Romanesque architecture, and the book of Kells . His work has the ability and versatility to expand in any direction, with its graphic edge and dramatic connotations. Dorothy Walker wrote of Harper’s work “the grid in fact, has something of the effect of a theatre curtain with its accompanying connotations of drama”. He exhibits regularly in Ireland and abroad. Harper primarily uses a metaphoric approach to painting using such motifs as the boat, angels, balance, landscape, and the figure. He has represented Ireland many times abroad in such countries as India, Switzerland, Italy, Latvia, England, France, the US and Sweden. He has received eight national awards for his painting, including: first prize for painting commemorating the 1916 Rising at the Municipal Gallery of Modern Art, Dublin, The Carrols Open Award at the Irish Exhibition of Living Art in 1971, the Arts Councils Bonn an Uachtarain de Hide at the Oireachtas Art Exhibition. 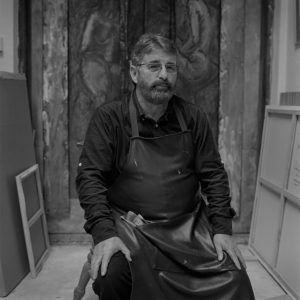 His work is included in many important public and private collections including The Irish Museum of Modern Art, San Francisco Museum of Modern Art. He is a Lecturer at Limerick School of Art and Design (LIT). A founder member of Aosdana and a RHA since 2002.